Some people know the teen idol as Miley Stewart from Hannah Montana, while some simply adore her as she is because of her style and looks. 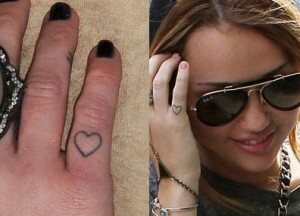 Whatever she wears, however she carries herself bears some meaning which her fans believe. Born at Nashville, Tennessee, on 23rd Nov’1992, the actress and singer is a fashion fanatic. Out of her 5 tattoos on her hand, this one an outline of heart, drawn on her right pinkie finger is a bond she shares with her family. 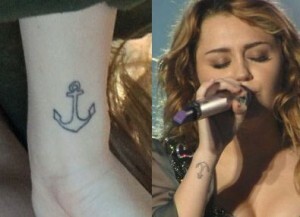 This anchor on her wrist makes her feel safe, and she got it drawn by Fabio Satori in Brazil.